Representative Joe Wilson (R-S.C.) is infamous for shouting "you lie" to President Obama during the president's 2009 State of the Union address. 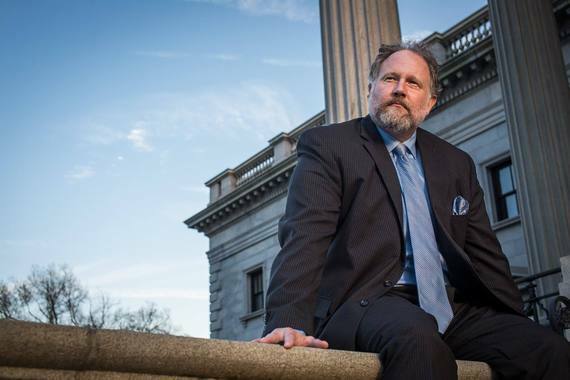 Wilson has held his post as South Carolina's 2nd Congressional District representative since 2001 and has never been opposed by a genuinely progressive Democrat -- that is, until now. "I remember sitting in the booth, and looking at the ballot and seeing 'Joe Wilson unopposed'," said Arik Bjorn, Joe Wilson's progressive challenger. "Nobody has the right to waltz off to Washington on my watch." But before Bjorn can directly challenge Joe Wilson in the general election November 8, he must first defeat Phil Black in the South Carolina 2nd Congressional District Primary June 14. Black, who is running as a Democrat and unsuccessfully ran for Congress as a Republican against Joe Wilson in 2008, 2010, and again in 2012, is what Bjorn calls a "fake Democrat." Those familiar with South Carolina's politics will recognize the term "fake Democrat" as Republican who runs for office as a Democrat to avoid losing to a stronger Republican during a primary election. South Carolina voters do not have to declare any political party affiliation when they register to vote, which means that any voter of any political persuasion can vote in any party's primary. Bjorn, a librarian and vocal Bernie Sanders supporter who was recently endorsed by the South Carolina American Federation of Labor and Congress of Industrial Organizations (AFL-CIO), was inspired to run for Congress after he heard Bernie Sanders speak during a town hall held at the Medallion Center in Columbia, South Carolina. "Bernie said, 'there is nothing that together we can not accomplish;' and in that moment I told myself, 'I must take a stand.' I was inspired by Bernie Sanders to run," said Bjorn. Bjorn's candidacy is a response to criticism from the left and from the right as to how progressives plan to legislate liberal principles at the state and local levels without creating a chasm (a la the Tea Party and Republicans) in the Democratic party between Bernie Sanders supporters and Hillary Clinton supporters. "If you only believe what's on your news feed, you'd think that everyone who votes for Bernie Sanders will never support Hillary, but, of course, that's not how you approach running for Congress," said Bjorn. Bjorn learned that government can function across party lines during his tenure managing South Carolina's SmartState Program, a $2 billion economic development program that used state lottery revenue to invest in research centers and major research institutions. The program was established in 2002 by the South Carolina State Assembly with bipartisan support. In 2012, under Bjorn's management, the SmartState Program turned into an economic boon for the state, and created over 8,000 jobs, many of which were high-paying, knowledge-economy positions. The program was also responsible for more than $1.4 billion in non-state investment in the South Carolina economy -- a seven-to-one return on the state's $180 million investment. "The program demonstrated how industry and academia can work side-by-side, so a community can prosper," said Bjorn. "I'm not running for Congress as a 'Berniecrat'. I'm running for Congress as a resident of South Carolina's Second Congressional District. The challenge is for us to find a way, beyond being liberal and being conservative to create a just and prosperous society." "There is blood on the hands of Governor Haley, and the other governors who won't expand Medicaid. Healthcare is a human right. End of story," said Bjorn. In 2013, Joe Wilson cosponsored H.R.2682 -- "Defund Obamacare Act of 2013," and Wilson has been an opponent of the Affordable Care Act. Meanwhile, South Carolina Governor Nikki Haley, a popular Republican has not expanded Medicare even though the ACA, also known as "Obamacare," would have allowed her to do so. Bjorn is unequivocal in his support for the LGTBQ community, as well as the Black Lives Matter movement, saying: "Black lives matter. Period. There is nothing else to say other than that." The congressional hopeful strongly opposes state Senator Lee Bright's (R-S.C.) bill, S.1203, which mirrors North Carolina's anti-LGBTQ bill HB2, also known as the "Bathroom Bill." "The legislation is barbaric, and I'd rather share a bathroom with a transgender person than share a bathroom with a barbaric legislator like Lee Bright," said Bjorn. "We need to end this culture of enemy-making. We need to stop alienating the LGBTQ community, and we need to stop threatening Muslims." Bjorn plans to end what he describes as "the culture of enemy-making" through what he calls his "legislative formula." It's a quasi-algebraic formula that he believes will be key for making effective progress toward legislating progressive principles such as universal healthcare, and equal access to higher education and academic resources. "I will always legislate from a place of what do we want, minus what we have, equals what we need to get there," said Bjorn. "I want to be a legislative explorer. I want to be a legislative uniter." Bjorn's ability to be a "legislative uniter" will depend on whether or not South Carolinians are willing to back a progressive Democrat, who is derivative of the Bernie Sanders movement. And with the current debates about voter enthusiasm, political revolutions, and "Democratic purity" within the Democratic party, South Carolina's progressive voters -- those who support Bernie Sanders and Hillary Clinton -- may have a candidate in Bjorn under whom they can unite.